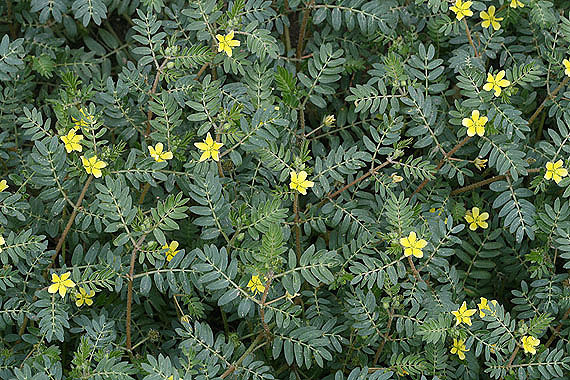 General Description: Puncturevine is an annual herb growing flat along the ground, from a simple, woody taproot. The fruit is a woody burr with sharp, rigid spines (strong enough to puncture bicycle tires or penetrate shoe soles). Flower Description: The small, yellow flowers are borne on short stalks at leaf nodes. Flowers are solitary and have 5 petals, 5 sepals and 10 stamens. Leaf Description: Leaves are opposite, oblong and have short stalks. They are 1 to 3 inches long and pinnately compound (having leaflets). Each leaflet is 1/4 inch long. Stem Description: Stems are numerous and up to 6 feet long. They form a dense mat. Fruit/Seed Description: The fruit is a woody burr with sharp, rigid spines. Puncturevine is a toxic plant and a serious weed in pastures, roadsides, waste places and cultivated fields. The spines of the fruit can cause damage to animals and people. It’s a problem to the fruit pickers when growing in orchards or vineyards.